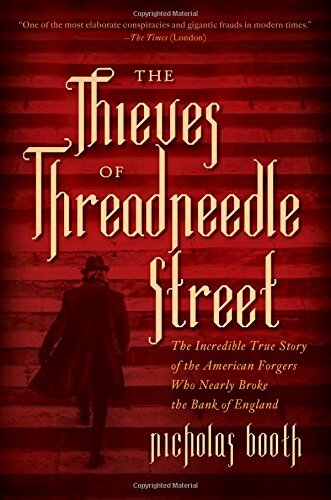 Author Nicholas Booth, whose previous work focused on the incredible biographical story of a World War II double agent, now tries his hand here at bringing into the light the story of a group of American criminals who took advantage of the wild and wildly unregulated times of the mid-19th century world’s banking and finance industry and attendant industrialization. Briefly, these forgers, of course, began their criminal careers in America where they were able to ply their trade using aliases and false storefronts and employing the relatively newly developed concept of advancing credit to buyers. Essentially, they obtained merchandise on credit for sale in their “store,” only to sell the same for practically pennies on the dollar to the public and then disappear before the bill came due from the supplier. As time progressed, their schemes grew in sophistication until they hit the big-time in New York. By this time, the main characters, brothers George and Austin Bidwell, had become part of the seamy Manhattan underworld and eventually made the acquaintance of their other two accomplices who would aid and support them in their most audacious quest. They would not only fleece as many banks as possible in continental Europe but would use the capital so obtained to go after the world’s contemporary financial behemoth: The Bank of England. Upon success, as Americans, they would flee Britain, return home, and live in the lap of luxury the rest of their lives. This might have happened, and nearly did, except for their having made a rather simple mistake—which will not be revealed here. As it was, the forgers, for all of their sophistication and previous success, tripped themselves up and ultimately managed to bring down the wrath of British justice on their heads. Initially escaping justice, the players were eventually pursued and tracked down by British authorities with the assistance of the head of America’s most well-known, and ethical, detective agency—Pinkerton’s—tried and convicted for their crime. At this point, it is proper to identify the two aforementioned caveats. Given the convoluted nature of this case (which may be difficult or confusing for some to follow), the author has employed a format that parallels this. Although written in chapters, each is broken up into individual sections that result in the use of flashbacks to describe locations, activities, events, or other characters involved in the story. Although the generally primary thread throughout is the trial and its procession to conclusion, the activities of each forger are meticulously recounted in the sections in order to tie up all of the threads. Complicating this are the aliases used by the forgers so, consequently, it is sometimes difficult to keep track of who is who despite the fact that this is exactly what the forgers wanted so as to confuse the authorities, financial and legal. Finally, in spite of explanations in the text, it would also help if one had at least some familiarity with banking and financial instruments, 19th century and otherwise, in order to understand just exactly what the forgers were doing and what made them so successful in deception. Perhaps a glossary of terms would have been helpful. In any event, the author has mostly employed the use of the National Archives of Britain and the files of the Bank of England to tell this story along with those of the Pinkerton Agency. Other primary and secondary sources complete the bibliography. Unfortunately, the memoirs of the forgers themselves are products of invention, exaggeration and/or self-promotion and, as a result, cannot be taken at face value, notwithstanding the clues and other possible information that might provide additional insight in terms of their use as sources. The illustrative and photographic section provides a visual look at the main players, venues, documents, and other Victorian era ephemera related to the case. Read carefully in order to keep track of this story as it proceeds with all sorts of twists and turns over the course of much of the latter half of the 19th century. It serves to confirm the old adage that crime never pays, no matter how audacious or convoluted.